Two little birdies, Tweety 1 and Tweety 2, chirruped that a new coffee shop had flung open its French windows in Felixstowe. Anxious to be among its first paying customers, me and Andy grabbed our buckets & spades, parked, then found out that said establishment wasn't due to open for another two days. Fiddlesticks: let's do this one next week. Nevermind, Like Kurt said: back we trot to Orwell Road and through the open door of the Shoka cafe, bar and bistro. 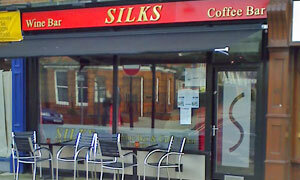 Hang on, that's out of date, for these premises are now Silks wine bar, coffee bar and restaurant. In an ambitious attempt to be all things to all punters, they're open from 8:30am to 10pm and offer OJ, beers, spirits, tea, plus main meals ("very competitive prices") and a "healthy bite" menu. You want it, they'll pour it or cook it. Alas, their houmous and pitta soldiers had decamped that morning, causing a quick swap to a bolognese baked spud. Meanwhile, yet more options: flick through a free newspaper, stare at one of the various flat screens (hello Cafe Libra) showing Sky News, or try the (free!) WiFi. Handy EEE netbook to hand, I did, and it worked well, so that's a Silky thumbs aloft. And here's the food: served in good time, tastes good too. Popular, this place, with the locals having a quick drink and/or light lunch and/or cuppa coffee. Facing us is an old fashioned display cabinet of huge and fabulous looking cakes. Shame that neither of us has the stomach for it, opting for a small caffeinated jolt instead. Silks, shine on. If it was a car -- Hyundai Terracan. If they were passing by -- Alan Price.